If you are looking for swimming lessons for your little one, recommendations from Local Mums are a great place to start. "I am over the moon with Puddle Ducks. It is without a doubt the best swimming experience we have had as a family and this is a credit to the wonderful teachers and the innovative, fun swimming programme. The old saying remains true – “you get what you pay for." I won’t be going anywhere else for my children’s swimming lesssons." We also teach simple life-saving skills from as young as six months old - the children love showing off their life-saving skills in our Pyjama Parties! And although we have spent many years carefully developing our progressive lesson plans to develop swimmers, our teachers adapt every activity to suit each child. Our baby-led swimming approach ensures that your child's needs are expertly fulfilled - never forcing development, but rather nurturing it to ensure a positive experience and love of swimming. 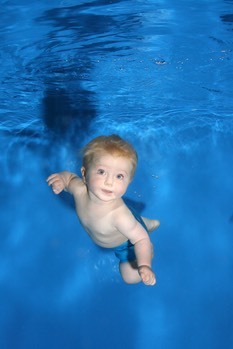 Floaties (0-6 months) - we welcome babies from birth who love the freedom of movement and buoyancy that water offers. In these classes, important signals are introduced to create the basis for the coming levels. Parents also enjoy magical bonding time. 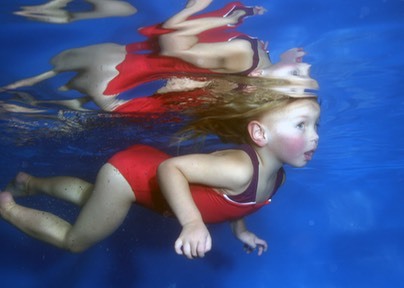 Dabblers (3-5 years) - this level is when you watch from poolside as your independent swimmer goes from strength to strength: a momentus occasion for both of you. We help them develop their balance and coordination further, to move smoothly and efficiently through the water. We look forward to sharing the Puddle Ducks experience with you and your little ones. Our classes currently run during term time in Reigate and South Croydon. Please do not hesitate to get in touch for further information. We look forward to welcoming new Puddle Ducks to our classes.